When I was in college, I took a course on popular fiction that included reading the ‘classic’ book How To Win Friends & Influence People. That was probably my first dalliance in the realm of what we in the 21st century tend to label as self-improvement books. To me, it was a bit of a flop. The advice felt dated, and I didn’t really like someone else telling me what to do. Last year, my fiance picked up a book that was recommended to him, called Made To Stick by a brotherly writing duo, Chip & Dan Heath. Although the book could hardly be called ‘self-help’, it genuinely changed my life thanks to its approachable advice, real-life examples, and multiple applications. That, and the other two titles in the Heath brothers’ cadre. In celebration of their newest release, I thought I’d introduce them all to you as a magical, versatile gift-giving option – particularly with college graduation upon us (and high school not long after) to inspire and arm the next wave of the workforce with some seriously amazing wisdom. Perhaps the most brilliant thing about the Heath brothers’ books is, as I mentioned, their versatility. Each book can be read independently, or as part of a package deal (the latter two reference earlier titles). They’re also applicable to people in a number of industries or life situations. Honestly there’s advice in these books that applies to a stay-at-home mom as much as to a marketer like myself. Made To Stick is the original book that set these guys on their writerly paths. The gist of the book is to capture what makes an idea ‘sticky’ – the specific qualities that allow some ideas to permeate our existing (or distracted) mindsets. Six core principles are explored through a variety of real-life stories – from scientific studies to business success stories – that make it easier to break down whether your brilliant idea actually has proverbial legs. Who should read it? Gift a copy to your executive dad or spouse, to help them both better accept their colleague’s ideas, and exercise sound judgement when they put forth their own. Buy another one for your business major niece or nephew, to push them way, way past the expected when coming up with big ideas. Of the three titles in the Heath bros’ library to date, I’d say this one is definitely the most geared to the sort of business side of things – but it’s still a great resource for anyone that has to actually, you know, think on a daily basis. While I genuinely enjoyed Made to Stick, it was Switch that really got me hooked on the boys’ mash-up of self-improvement, psychology, and real world ways to essentially change your world. The book simplifies the way to shift someone’s behaviour with a 1-2-3 punch: direct the rider, motivate the elephant, and shape the path. Trust me when I say, all of that will make sense by the end of the introduction, and be downright drilled into you by the time you reach the end of this incredible book. This is, ironically enough, a book with ideas that are very much ‘made to stick’. It again sources real-life examples on a macro and micro scale – from a supply chain manager who showcased corporate waste by creating a mountain of work gloves to a woman who found a new approach to housecleaning she could actually live with to a principal that seriously cut down on behaviour issues and lateness in a challenging inner city environment – there are dozens upon dozens of examples you’ll be able to apply to your everyday life. Of course, that starts with identifying what needs a change: share a copy with your coworker that’s frustrated with a workplace behaviour, or gift a book to your sister that’s dealing with a consistently sloppy or aggressive child, or aim higher and hand one over to your friend that’s trying to find a new way to get people to care about their big, charitable issue. The simple method + results will astound you. 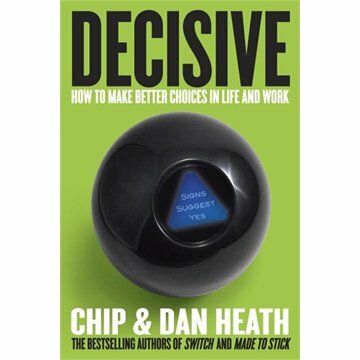 The latest & greatest from Chip & Dan Heath is Decisive, which as you can probably guess by the title, is all about making better decisions. I’m not just talking about something as simple as eating broccoli over a bag of chips. In this book, the Heaths’ help you understand the motivations and outcomes of your decision, as much as making the choice itself. With four key steps (and several underlying qualifiers within each step), Decisive arms you with a checklist of questions and activities that will make those tough, and I mean tough choices at least a little more palatable – if not downright easy. What’s particularly interesting about this book is each story actually presents the reader with a really challenging ‘What would you do?‘ conundrum. There are no easy answers here, and until they break down each problem with one of their decision-making approaches, you’ll be hard-pressed to select the best outcome (although it gets a touch easier as the book progresses). Again, the advice is far-ranging. One particularly memorable case study involved a man dealing with an incredibly life-threatening disease on the eve of the birth of his first child. Left untreated, he could conceivably live for another five to ten years. If he went through with a bone marrow transplant, he could either fully recover from the disease, or be in a position where he’d die within a year. If the idea of even beginning to make a decision like that is giving you hives, fear not, that’s what the book is here for. In fact the outcome of that particular story felt almost blindingly simple upon reading the decision-making process the man in question went through. Although that’s one of the more extreme examples in the book, there are plenty of others that deal with more everyday occurrences, like a woman deciding whether to move for better dating prospects, a man deciding whether to give up the day-to-day reins of his not-for-profit to help grow the concept in other communities, or a university administrator contemplating firing a particularly difficult staff member. It’s a great hybrid of everyday, personal advice and business-related decision-making tips, making it a perfect fit for that high school senior debating between schools, a good friend in her 20s that’s unsure of her next step in life, or an executive that’s hesitant to invest in a new business direction. 1) Leave a comment by April 14th with the Chip & Dan Heath book you’re most excited to read, and why. 2) Entries are limited to one per person / per email address / per household (or more if you score bonus entries). A random draw will be conducted on or around April 15th to select the winners, who will have 48 hours to respond before another winner is chosen in their place. 4) Bonus Entry: Add all three of these fantastic books to your to-read shelf on GoodReads + leave me a link back in the comments below to earn yourself up to three bonus entries. Decisive – certainly this would be the most interesting to me. You’ve made me curious about Switch. Like the covers too! http://www.goodreads.com/review/list/15508767?shelf=to-read ADDED ALL THREE TO MY GOODREADS LIST – SEE THE BOTTOM. Added all three books to my Goodreads ‘to read’ list : http://www.goodreads.com/review/list/11787979?shelf=to-read I would love to read all three but I think Decisive is what I need to read! Switch sound so interesting to me. Decisive – is what i need! I’d love to read all three, but I think Switch is the one that I need the most. All the books seem like they would help teach us life lessons but I think Decisive would help me more personally right now to make the right choices. I would choose Switch because that can apply in so many instances. I have to read these books!! They’re all interesting, but I’d read Switch- How to Change Things When Change is Hard first. I’d want to read Made To Stick, because I have a pipe dream to be on Dragon’s Den. I’d benefit most from reading Switch. Decisive because I need lessons in making good decisions! They all sound really interesting in their own way. I think I’d start with Made To Stick because it’s the very first one. Switch sounds really interesting. My sister is a psyc major so i can see giving her this. I would like to win Decisive because we can all continue to learn how to make better decisions without letting fear and Indecisiveness block our thinking. I think Made to Stick, it would be interesting to find out why somethings catch on. I’ve never heard of these books but would LOVE to win the set. They sound practical and thought provoking! 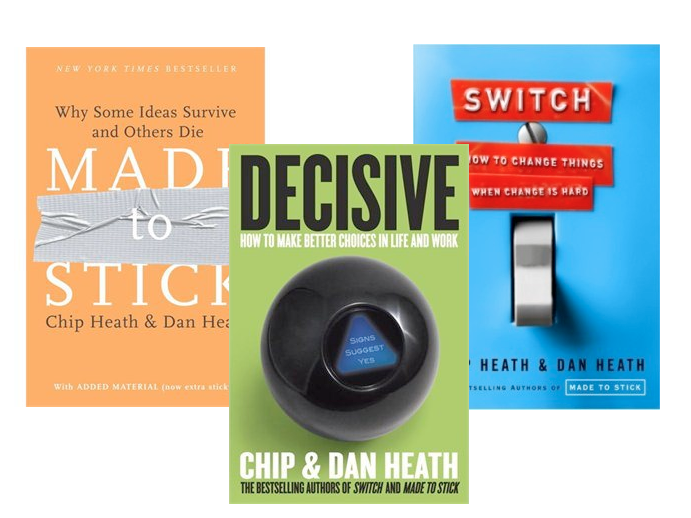 I think Decisive: How to Make Better Choices in Life and Work is the book that would most resonate with me right now (although I’d still like to read all three!) Thanks for the chance to win, and for letting me know about these authors and books. decisive! I’m the worst decision maker ever………. switch is the book i’d read first. 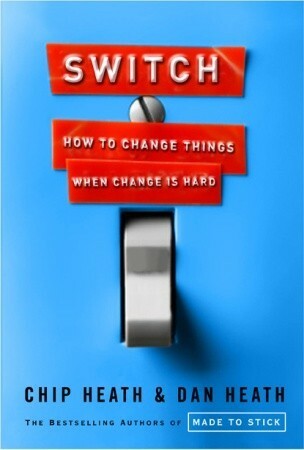 Switch (How to Change Things When Change Is Hard) is the book I need to read. I this switch is the book I would like to read. Made to stick is the book I most want to read as it is the first and sounds like a great starting point. I haven’t heard of these guys before but I am interested in reading all 3 now. I’d like to start with first one. I want to read Decisive. It sounds like a great book. Switch would be the most interesting for me. would love to read all 3. I need to be DECISIVE so I would love that book. I think I could use Switch. Switch – I think it could really help me. 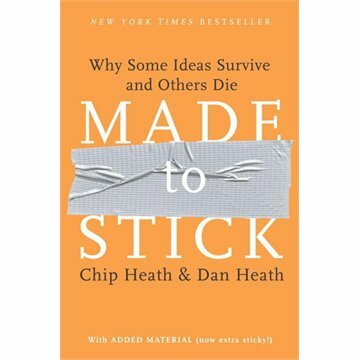 I’d most like to read Made to Stick simply because that duct tape on the cover intrigues me. I’m most excited to read Made to Stick because it’s intriguing why some ideas hang around and others quickly vanish. I would like to read Stick because that’s something I work with in non-profits and I would love to see what views the authors have to add to the topic! Decisive! I’m so terrible at making choices. Made To Stick I like to start at the beginning with books, even if the’re nonfiction. switch sounds like a good read!! !might give me some good ideas to change somethings!!!!!!!! All 3 please? I think Switch sounds thecoolest. Books added to my goodreads to read.